Avrusa Sarethi is a Dunmer apothecary living on Sarethi Farm. She works throughout the day, tending to her Nirnroot farm and keeping her wayward sister, Aduri Sarethi, in check. She claims to be the only person alive capable of successfully nurturing Nirnroot plants from seeds, thanks to her long-term friend and mentor, Sinderion. She used to have a shop in Vivec City, but had to flee when Red Mountain erupted. She wakes up at 6am, after sleeping in any of the three beds in her home, and will have a one hour breakfast with her sister. After that, both sisters will leave to work on the farm. She will usually work in the Nirnroot allotment, while her sister will run around the farm or work in the gourd patch. At around 8am, she will take a quick drink while standing in the field, before working again until sometime between 11pm and midnight. She will then go inside with her sister and sleep before repeating the cycle the next day. 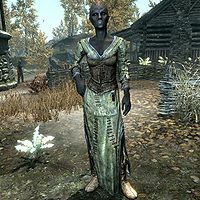 Avrusa Sarethi wears a set of clothes with a pair of boots. She also carries a belted tunic, but doesn't wear it. Avrusa also carries a potion recipe on her, a leveled dagger (up to elven quality at level 20), a few potions, and a selection of common items and gold. Avrusa knows a variety of spells to defend herself. From the Destruction school, she knows the spell lightning bolt and sparks. From the Alteration school, she has access to oakflesh. From the Restoration school, she has lesser ward. Avrusa: "Aduri, how come the fields haven't been tilled like I asked?" Aduri: "Because it's boring. The fields are going to do fine... you don't have to dote over them so much." Avrusa: "Boring? That food is paying for everything. If we lose even a single crop, we could starve or be forced to beg. I won't have it!" Aduri: "All right, I understand. I'll do it tomorrow, okay? Just get off my back." Aduri: "Have you decided if I can head up to Solitude yet? I hear it's the best place to meet someone who may be willing to teach me to paint." Avrusa: "I'm sorry, Aduri, not this year. Perhaps next year after the harvest, I don't know. There's so much to do." Aduri: "It's not going to be next year, nor the year after that! You just care about this farm more than you care about me!" Avrusa: "Painting won't put food on the table, but our crops will. Be patient Aduri... it will happen someday, I promise." Approaching Avrusa Sarethi will have her greet you in a number of ways. If you approach her while she isn't currently in her sleep package (which is between midnight and 6am) and you've yet to start the quest Smooth Jazbay or collect the 20 jazbay grapes necessary to complete the quest, she'll greet you by saying: "I don't suppose you could come back another time? I'm very busy." or "I have a lot to do around the farm, so make it quick please. What is it you wanted?" or "I'm a bit busy at the moment, what did you want?" Speaking to her during her sleep package without the necessary number of berries will have her say: "I hope this is important... I get little sleep as it is." If you approach her with the necessary number of jazbay grapes in your inventory and you've started the quest to collect the grapes, she will greet you by saying: "Any luck locating those jazbay grapes?" Speaking to her during her sleep package under the previous conditions will have her acknowledge your presence with: "Ah, you're back." After completing Smooth Jazbay, she will welcome your arrival by saying either: "Always a pleasure. What brings you back?" or "I'm still busy, but I can always make time to speak with you." Leaving her company before starting Smooth Jazbay or gathering the necessary number of grapes to complete the quest will have her return to the duties with the comment: "Back to work." If you collect the necessary number of grapes, but don't turn them in, she'll send you off with: "Good luck finding those jazbay grapes, they're very rare." After completing the quest, she'll instead say: "Come visit again sometime." You can ask Avrusa if her sister often causes problems, to which she responds: "Aduri is what some would call a free spirit, but around here there is a tremendous amount of work to be done, not to mention dangers that she is not ready to face." Asking her if she is an alchemist will have her reply: "I used to be. There isn't much time for that in my life anymore I'm afraid. I actually owned a shop in Vivec City long ago, but I had to leave all that behind when the Red Mountain erupted. Perhaps someday I'll reopen a shop here in Skyrim." Questioning her about the nirnroots found on her farm will have her explain their presence: "Actually, I'm growing it if you hadn't noticed. I'm the only person alive that can cultivate nirnroot from a seed to a fully grown plant." Continuing to question her on how she can actually grow Nirnroot will have her explain how she learned to from a mentor years ago: "I had quite the mentor. He taught me everything he know [sic] about the nirnroot and its strange properties. I haven't seen him in many years. I wonder what became of him..." After advancing far enough in the quest A Return To Your Roots to have been made aware of her and Sinderion's relationship, you will also be able to ask her if it was Sinderion who taught her how to grow nirnroot, to which she responds: "Yes. He was an absolute genius when it came to the nirnroot. Sinderion made it his life's work, developing all sorts of interesting concoctions." Pointing out her state of exhaustion to her will have her explain why she is so tired: "Is it that obvious? Sigh. I've got my hands full here. Between the farm chores, cultivating my supply of nirnroot and keeping a tight rein on my sister Aduri, there's little time for rest." You can offer your assistance to her, to which she will happily tell you about her need for jazbay grapes: "Really? That would be a pleasant change. One of the ingredients I need to cultivate nirnroot are jazbay grapes... the acidic content of the juice is perfect for the soil. I need twenty of them for my current crop." If you don't wish to take on the task, you can instead wish her good luck reigning in her life, to which she will respond: "I don't need luck, I need rest." If you accepted the quest and already have the necessary number of grapes, she will happily accept them from you: "My goodness, how did you ever come by all of these? No matter, I appreciate your generosity. Let me at least give you something for your efforts... finding all of these couldn't have been easy... or cheap." If you return at a later time with the required grapes, she will instead say: "Fantastic. I was concerned I had asked for too many, but I'm glad to see you proved me wrong. Let me at least give you something for your efforts... finding all of these couldn't have been easy... or cheap." If you have a crimson nirnroot in your inventory, you can present it to her to see what she thinks of your discovery: "Crimson Nirnroot? I'd heard such a strain existed, but never imagined I'd see any in my lifetime. Where did you find this?" Revealing that you found it in Blackreach will have her ask that you search for her old mentor, Sinderion, who disappeared in Blackreach sometime ago. "Blackreach... why does that sound so familiar? Of course! It's where my mentor, Sinderion said he was going to do his field research. It's been... years I think, but perhaps you could still find him." Informing her that you found Sinderion's remains in Blackreach will have her sadly reminisce about Sinderion, while expressing an interest in continuing his research: "I knew this day would eventually come. At least poor Sinderion died doing what he loved, his field research. I told the old fool he should take it easy, but he was too stubborn. Perhaps someday I'll continue where he left off, it's the least I can do considering how much he did for me." Returning to her with 30 or more crimson nirnroots and offering them to her will have her say: "You've gathered quite a few of them I see. I'll search through Sinderion's notes and find some more information about the Crimson Nirnroot and its properties." After you hand over the crimson nirnroot, she will go on: "Thank you. You've done alchemy a great service by helping to complete Sinderion's work. I'd like to give you this tome...it's one of Sinderion's greatest works. I believe you've more than earned it." Asking her about how she met Sinderion will have her say: "When I was very young, I was sent to Skingrad in Cyrodiil to study with him. He was a strange Altmer... paid more attention to his research than his own well-being. He lived in the basement of an inn for goodness sakes!" Asking how Sinderion found himself in Skyrim will have her tell you how he arrived on her doorstep one day: "Well, after I fled Morrowind during the eruption, I made my way here... my family had purchased this farm and its all we had left. Years later, Sinderion simply showed up at our doorstep asking to stay for a while... said he was going to do field research. He stayed with us for decades... became an uncle of sorts to Aduri." Asking her how he came to be in Blackreach will have her tell you about how he left them to do research in Blackreach: "One day he simply ran out to me in the field, excited that he'd made some sort of a breakthrough and he was going to head out on another trip. He never returned. From the journal you discovered, I'm sure you know the rest." Aduri: "Where did all these pretty red plants come from?" Avrusa: "Remember Uncle Sinderion? 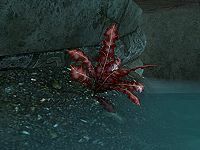 These are the plants he was searching for... the Crimson Nirnroot." Aduri: "They're beautiful. I can see why he wanted to find them." Avrusa: "One day, these beautiful plants will make us famous and we can finally move off of this farm... thanks to Sinderion." Smooth Jazbay: Collect 20 Jazbay Grapes for Avrusa Sarethi. A script note for Aduri and Avrusa's conversation about Aduri asking Avrusa if she can move to the city to become a painter suggests that Avrusa was originally her mother in development, and not her sister. Like her sister, Avrusa's skintone is unique to her and unavailable to the player in character creation. This page was last modified on 25 March 2018, at 21:30.